Having cows right on campus is one of the things that makes UConn special. It’s the high-quality milk produced by those cows that is the main ingredient in the ever-popular UConn Dairy Bar ice cream. In fact, Hoard’s Dairyman ranks UConn’s herd in the top 20 of some 47,000 dairy herds nationwide. In keeping with these high standards, UConn is now one of the first universities in the United States to adopt the most technologically advanced way of managing and studying a dairy herd: two new robots have been introduced to the herd that enable the cows to choose when to be milked. The new voluntary milking system will change the day-to-day life of the herd. Previously, each cow was milked three times a day, at the same time every day. When the cows were ready to be milked, they got noisy, says Steve Zinn, department head and professor of animal science in the College of Agriculture, Health, and Natural Resources. There’s a different atmosphere in facilities with voluntary milking systems. Since the cows are milked on demand around the clock, they are generally quiet and calm and spend a lot of the time lying down relaxing. When ready for milking, the cow walks to the robot, which starts each visit by washing the cow’s udders before attaching a separate milking unit to each teat or “quarter.” If one quarter finishes milking before the others, that quarter’s machine will stop and be removed, which is likely more comfortable for the cow, while the other quarters finish being milked. 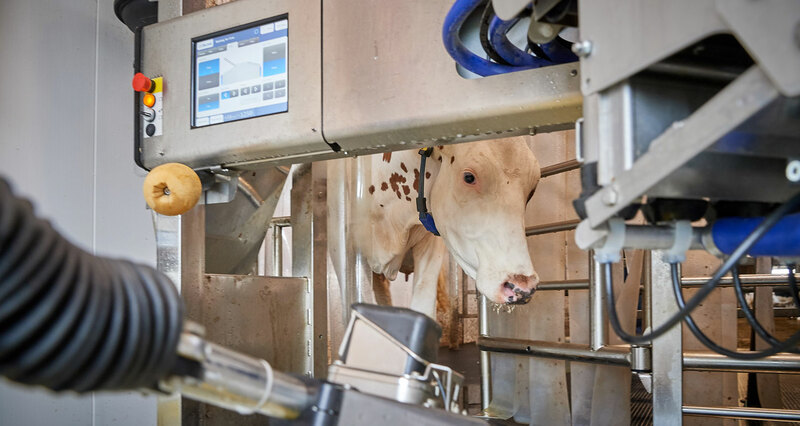 After six to eight minutes, and after around 30 to 50 pounds of milk has been collected, the milking units detach and the cow walks away from the robot. With the new system, each cow is expected to visit the robots voluntarily one to four times a day. The voluntary milking system also provides new research opportunities for UConn. Each of the more than 80 cows is equipped with a smart device gathering data 24 hours a day on the cows’ behaviors, health, and milk production. 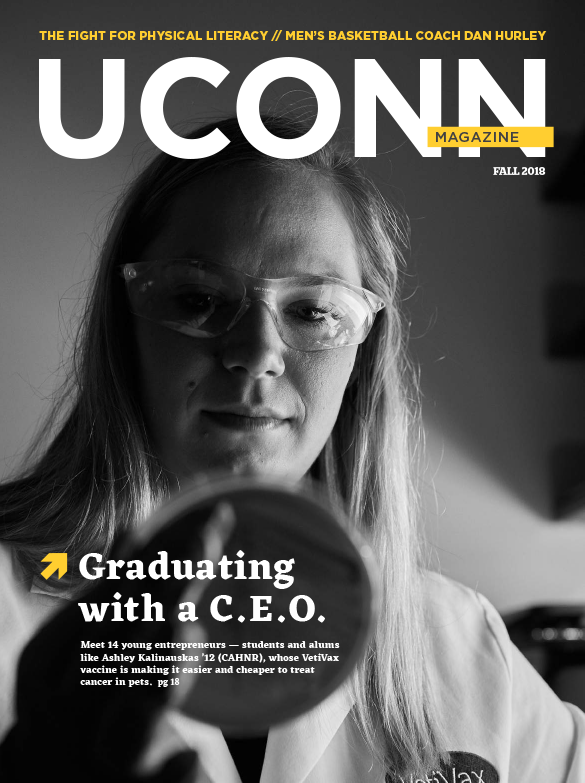 A flood of data begins flowing as soon as the milk does, and all of this data needs management, analysis, and interpretation, which is where UConn Engineering comes in. “We are working to figure out how we are going to use the data, how we analyze it and start making predictions with it,” says Matthew Stuber, assistant professor in the Department of Chemical and Biomolecular Engineering. For instance, data on the cow’s movement — or lack of movement — can be an indicator of health, and data on milk quality can indicate what kind of grain is best for a particular cow. By analyzing that information, the engineers hope to develop ways to predict exactly how to tailor conditions for each cow and achieve better outcomes for the facility as a whole. Since the robots are taking care of the milking, says Zinn, this leaves caretakers more time for managing the whole cow, and researchers more time for new and innovative research.